A Kelpie is a kind of mythical horse. 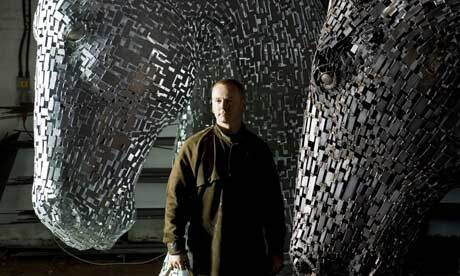 Soon there will be two massive sculptures of Kelpies’ heads at the entrance to the Forth and Clyde Canal. The heads will rock to operate the locks and push boats into the canal. How creative is that? But the best part is that the idea came not only from water and mythology but from the fact that there was a connection between the horse and the canal. 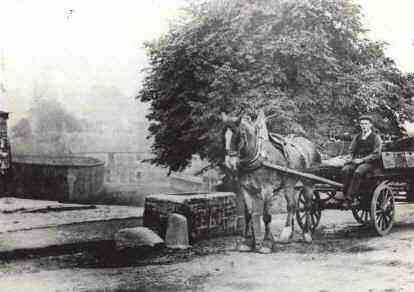 Horses were used all along the canals during the times when we had an industry in Scotland. And now for the best part! The sculptor Andy Scott (who also created the lovely Nula with the Hula in Belfast) found out that there is another link to the horse in the immediate area. There was a horse called Carnera who used to pull floats of Irn-Bru for Barrs in the 1930s. This horse was reputed to be around 19 hands high and was therefore something of a giant. 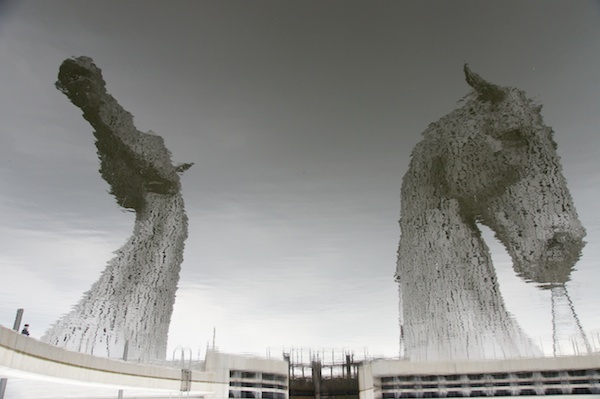 “They will create one of the most dramatic gateways through which to enter Britain: two vast equine heads, centrepiece of a £49m eco-park near Edinburgh, are to guard the entrance to a canal link connecting the Firth of Forth with the Clyde in Glasgow. What a fantastic idea for the area. Grangemouth for so long a complete blot on the landscape, inhabited as it has been for the last half century by BP and the like. Admittedly there have been many jobs created there over the years and the area has benefitted from all of that but to create a park there is a wonderful use of the space. I look forward to seeing the Kelpies! UPDATE – here they are in 2014…..in reflective mode! Previous Who is Liam Ó Maonlaí?